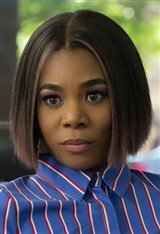 Born and raised in Washington, DC, Regina Hall made her television debut in 1992 with an appearance on the ABC soap opera Loving. Work proved to be sporadic, with several years passing before she landed another guest appearance, this time on New York Undercover. After playing Candy, a stripper in the feature film The Best Man (1999), roles began to come her way more frequently. She starred in Love & Basketball and Scary Movie (both 2000), after which followed three Scary Movie sequels. A three-episode arc as the junior associate to Robert Downey Jr.'s character on Ally McBeal in the spring of 2001 led to her becoming a season regular for the 2001/2002 season. When that gig ended, Regina moved back into feature films with roles in Malibu's Most Wanted (2003) opposite Jaime Kennedy, King's Ransom (2005) with Anthony Anderson, Danika (2006), playing the psychiatrist of Marissa Tomei's character, and the comedies Death at a Funeral (2010), Think Like a Man (2012) and Think Like a Man Too (2014). She also appeared in the comedy Vacation (2015), Barbershop: The Next Cut (2016), the mystery thriller When the Bough Breaks (2016), as well as the comedy Girls Trip (2017). Most recently, Regina returned to theaters in the drama The Hate U Give (2018) where she starred alongside Amandla Stenburg and Anthony Mackie. Most recently, she was seen in the movies Shaft (2019) with Samuel L. Jackson and Little (2019) with Issa Rae. Regina earned a Master's degree in Journalism in 1997 from New York University.